A very common yet undiagnosed or misdiagnosed problem that we find in patients is parasites. They can live in the body for many years without causing symptoms and when they do, the symptoms are often subtle or vague. Helminthes which are multicellular parasites or worms and are most commonly found in the intestines, liver and pancreas and do not reproduce in the body. 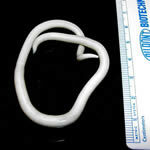 An adult worm (see photo credit CDC.gov/parasites) can range from 15-35 cm., or almost 14 inches! Protozoa which are single celled parasites that can infest the entire body causing serious infections. They rapidly multiply in the body. The most common in the U.S. are giardia and cryptosporidium. Helminthes are contracted through exposure to feces, water or soil and tend to be more common in children, while protozoa can be found in food, water, insect and animal bites and contact surfaces. Parasites are ubiquitous and difficult to diagnose without the right testing as their symptoms are vague or mimic other illnesses. Parasites evade detection and diagnosis better than most human pathogens, explaining why some healthcare professionals deny their existence or clinical relevancy. Since diagnostic tests are often falsely negative or not reliable, astute clinicians must deduce the presence of parasites. In other words – once the more common causes of GI problems, such as bacterial or yeast overgrowth have been eliminated, the only possible cause of the symptoms must be parasitic. I performed a study on 195 serial stool tests (CDSA) performed by Genova Diagnostics and found that parasites were detected on 17.9% of the samples. Now that a DNA analysis is offered by Metametrix Labs, I have found a much higher detection level. The conclusion is that parasites are a very common cause of gastrointestinal symptoms. Complaints of chronic GI symptoms such as diarrhea, constipation, nausea, abdominal pain, bloating and gas are common. Occasionally all tests in such patients for GI functioning are normal, suggesting that something other than unfriendly flora is causing the symptoms. This used to perplex me – but not any more. Now I know that the hard-to-detect parasites are quietly skulking behind the scenes. Parasites do not seek to damage the host unnecessarily; they only want a comfortable home. Parasites often do not cause many symptoms, unlike unfriendly yeast or bacteria. But on the other hand, parasites secrete toxins, some of which are toxic to the brain and may cause psychiatric and neurological symptoms.